Last week, I shared the lessons I learned and the drawbacks to moderating comments in WordPress. In this post, I highlight six plugins that solve a problem I encountered or enhance comments for both readers and site administrators. All of the plugins are free of charge and available from the WordPress plugin directory. I discovered that not all comments need to be moderated. Crowd Control, by Postmatic, gives readers the ability to report comments they feel don’t adhere to a site’s commenting policy. When enabled, a new option is displayed on the General – Discussion settings page. You can configure how many reports a comment needs before it’s sent to the moderation queue and whether administrators should be notified when it happens. If an administrator approves a comment that’s in moderation due to hitting the threshold, it won’t end up back in the moderation queue. This gives administrators the last word on whether a comment is acceptable or not. If you think a comment needs an administrator’s attention or does not adhere to the WP Tavern commenting policy, hover over the comment and click the report button. A new column is added to edit-comments.php that displays how many reports a comment has. It’s important to note that detailed information of who reported the comment is not saved to the database. The system is open for abuse but I trust that the Tavern readership will use it responsibly. Comments that are pending moderation in the WordPress backend that are in response to another comment are hard to moderate. Show Parent Comment, developed by Stephen Cronin, adds a Show More dropdown to the edit-comments.php screen that allows administrators to see the text of the comment that a person is responding too. I’ve used this plugin for more than two weeks and I enjoy the user interface. It looks and acts as if it’s a natural part of WordPress. Chris Christoff created a ticket in Trac with the suggestion that a user interface element like the one in Cronin’s plugin be added to core. If you have feedback on the best way to accomplish this, please add it to the ticket. Epoch is a plugin developed by Postmatic and a few other contributors that enhances WordPress’ comment system. Unlike services such as Disqus or Livefyre that replace the comment system, Epoch adds features to WordPress’ native comments. This allows you to keep comments within your database at all times without relying on a third-party. Epoch applies a series of visual enhancements to the comment form. Replies from the post author are a different color from regular responses and the date and time the comment is written is displayed at the top. Epoch also uses Ajax to send and receive comments which eliminates the need to refresh the page. Epoch has a front end moderation capability that allows site administrators to approve, trash, or spam comments. Unlike the native comment form, Epoch doesn’t load the comments unless the browser reaches a certain point on a post or is accessed via a direct link. In most instances, the comment form loads quickly but on certain mobile devices, the lack of speed is noticeable. The team is aware of the performance issues and is attacking the problem with a three stage approach. 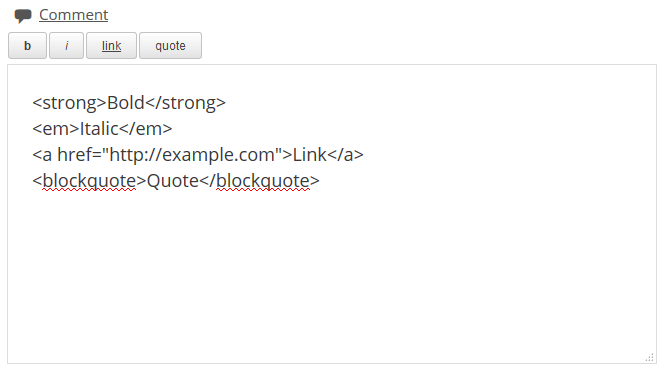 In WordPress 4.3, the allowed HTML tags text displayed near the comment form was removed. The tags were removed because they’re note relevant and confusing to most users. While I agree that the text is not relevant, I think the comment form should have basic text formatting buttons so readers don’t have to remember and manually type HTML tags. Once Basic Comment Quicktags is installed, navigate to Settings – Discussion and check the box to enable them for comments. When enabled, the comment text area will have Bold, Italic, Link and Quote buttons. The best part of this plugin is that it exposes a built-in core feature using the Quicktags API added to WordPress 3.3. Text formatting buttons in the comment area is a courtesy I’d like more site owners to give to readers. Simple Comment Editing, developed by Ronald Huereca, adds the ability for readers to edit their comments in a limited time frame. By default, readers have five minutes to edit their comment once it’s submitted. Although no configuration is necessary, you can alter the time and behavior of the plugin by using actions and filters. I’ve changed the time limit to 15 minutes on the Tavern to make sure readers have plenty of time to make edits. With Simple Comment Editing installed, the amount of contact form submissions and requests to edit a comment have gone down considerably. Postmatic is a plugin that ties into a service and has a number of features. Readers can subscribe to posts or to comments and receive updates via email. Postmatic has a beautiful email template that shows the most recent reply, the commenter’s Gravatar, and a recap of the post and conversation. Readers can respond to comments via email without having to visit the comment form. Site administrators can reply, trash, or submit comments to Akismet via email. It’s important to note that Postmatic is not a third-party commenting service. Instead, it uses the native comment system in WordPress allowing you to keep and own your data at all times. While I moderate comments from the WordPress mobile app or the WordPress backend, Postmatic is a great fallback. I also think the email template looks great and offers a better user experience than the comment notification emails provided by WordPress. Postmatic does a lot more than what I describe above but for the purpose of this article, I focused on the comment portion of the service. Postmatic is a new addition to the Tavern that I encourage you to try. After trying it out, please tell me about your experience. I especially wany to know if it’s easier to keep track of and take part in conversations. One of the problems I’ve yet to solve is being addressed by a number of WordPress contributors in ticket 33717. If all goes well, it’s possible this feature will be added to WordPress 4.4. Once added, readers whose comments end up in the moderation queue will automatically be notified by WordPress when it’s approved. Even with all the features these plugins provide, I don’t think the comment system in WordPress or the form on WP Tavern is perfect. I’m not sure if perfection of either can be achieved. However, I think both are improvements over the previous iterations. If there’s a plugin you use to improve WordPress’ native comments or its moderation system, let me know about it in the comments. 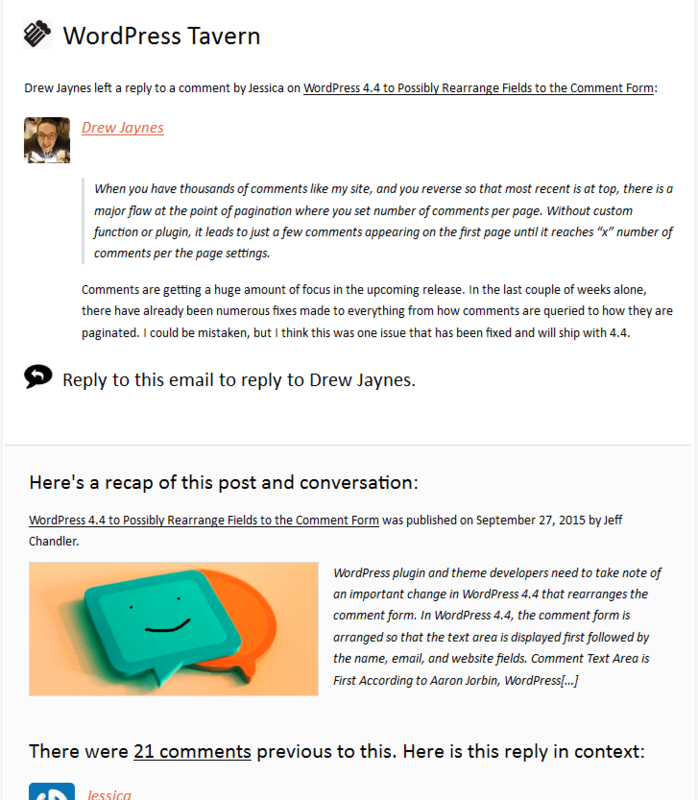 431 Responses to "6 WordPress Plugins That Take Native Comments to the Next Level"
Hey there, You’ve done a fantastic job. I’ll definitely digg it and personally recommend to my friends. I am confident they will be benefited from this site.